2019 could be the year of the receiver for Notre Dame. Chase Claypool will be the headliner, but junior Michael Young Jr. could also make a case as the Louisiana native has had a tremendous spring. The 5-foot-10, 190-pounder has flashed at times over his first two seasons in South Bend as he’s recorded 11 catches for 156 yards and two touchdowns. Young believes experience and flexibility will allow his game to take off in 2019 as he isn’t close to hitting his ceiling. “At this point in my career, I understand what the coaches are asking me to do,” explained Young. “I can be anything you want. I can be a physical guy and a blocker. I can try to be Chase Claypool. I don’t have the stature for it, but I’ll give you a good fight. I can be the speed guy or the guy like a Braden Lenzy or Lawrence Keys III. 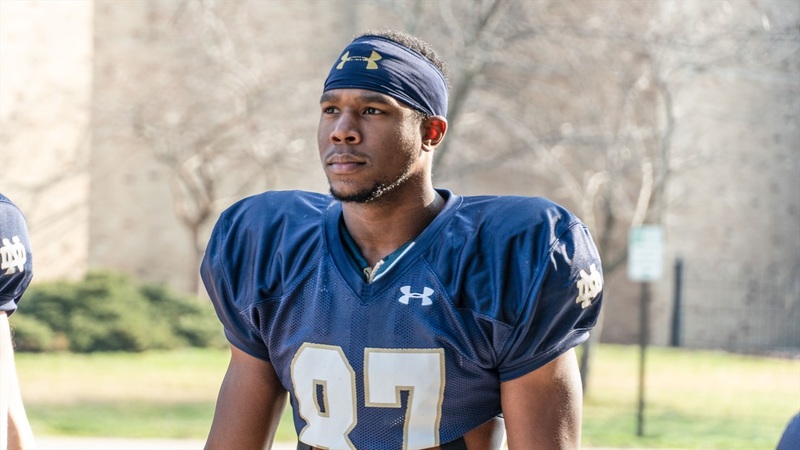 Young has moved around the field since arriving at Notre Dame, but he hasn’t shown frustration and has now found a home at the X (field) position. Young welcomed the ability to stay at X as it fits his game. However, if Young is asked to play to the boundary more, he’s not opposed to it. “The field is awesome,” Young said. “I love it. You get the one-on-one matchups as if you’re in the boundary. You also get the zones. The hitches, slants and outs – that’s give and take for me. That’s easy. I like having an open field and space to work. It’s clear Young is oozing confidence at this point in the spring because he’s taken steps forward individually, but also because quarterback Ian Book has been a consistent force. Young’s words are powerful, but Book’s development could lead to high-flying offense for the Irish in the fall.